Home » Latest Internet News » What will the future of web design look like? Two major visual trends are taking over . Firstly, we are seeing a wider use of layers, creating a stronger sense of depth and perspective in websites. It will take parallax to the next level, with parts seeming to move at different paces as you scroll. As a result, layouts will become messier, with elements of all sorts (images, textures, videos and more) combined and arranged on top of each other. The next big thing we can expect is the incorporation of new materials. Designers have taught themselves to make the most out of 3D programs in order to bring familiar materials to life. Now that they’ve become experts in this field, they’ll start inventing new materials that don’t exist in real life. After all, we’ve all had enough of wood or cactuses, which have been popping up everywhere. It’s time to dive into a novel and exciting realm, with materials that blur boundaries and puzzle viewers: are they soft or hard, smooth or textured? Skeuomorphism and flat design are now behind us, and we’re going back to inventing a new form of realism. The beginning of 2018 was marked by the launch of our very own Wix Playground. The idea behind this project was to talk web design to professional creatives, a crowd that is considered hard to impress. 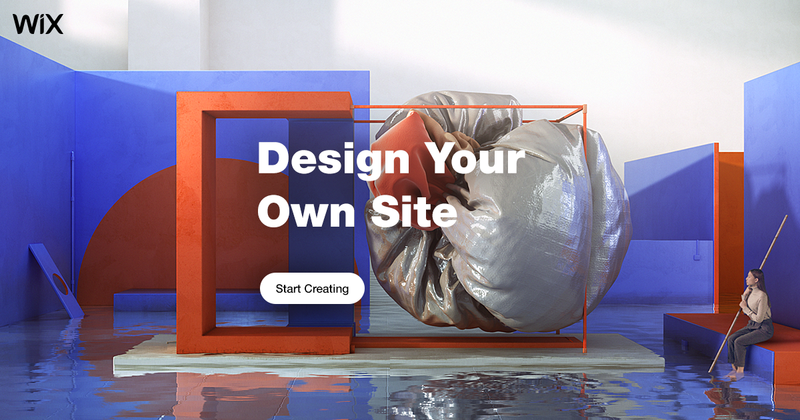 To rise up to the challenge, we built a full ecosystem comprising of a stand-alone website, a collection of templates, and plenty of other content – all made for designers, by designers. Since we believe web design should be as fun as playing on a blank slate, the ‘Playground’ tag came pretty naturally to our lips. It embodies a place where designers can feel secure enough to get crazy, while still relying on a powerful web editor to keep things under control. I believe that the Playground succeeded in showing how, when given the right tools, designers can independently showcase their work online – without giving in to technological constraints and artistic compromises. This kind of creative playfulness is easily achieved with the outstanding web design features Wix offers. On top of being the only one enabling you to create from design to live, the Wix platform provides users with fully customisable layouts, a huge selection of design effects, and retina-ready image display. Thanks to this powerful set of features, the Playground website itself was created entirely on Wix, by designers only – without any developer assistance! Designing for a crowd of professional creatives was one of the most challenging, thrilling and rewarding experiences I’ve had the chance to work on. As designers, the concept is very close to our hearts and we can really relate to it. And it’s only the beginning of the journey, as many more exciting things are yet to come. In the Playground, we’ve established the right foundations that will enable it to continue evolving. In the near future, we’d like to open the doors to more artists, inviting them to showcase their own portfolios made with Wix. New header videos will also be released soon. Another interesting aspect of the project is our collaboration with Dribbble for the ‘Take the Playground’ contest, in which we invited designers to reimagine the word ‘playground’ in any way they wanted (from 3D modelling to illustration, GIFs and more). The result was one of the most engaging contests the platform ever had, and a true celebration of fun and creativity.